A roti needs to be flat, soft and tasty. It also needs to be strong enough to pick up and wrap up different curries and meals. Making the perfect roti needs skill and practice, but most importantly it needs the right atta. Atta is a whole wheat flour that is made from durum wheat. Is the perfect flour to use when making roti, as well as other doughs like chappati, paratha and puri. It is ground in stone mills called chakki and has an authentic taste and texture. It is a basic in many homes, but there are so many different brands on the market that it can be difficult to choose which might be the best for you and your family. Some are organic, some are gluten free, and some contain extra ingredients. Different ingredients and textures can create slightly different rotis, so it is important to know what you are buying. Below you will find a complete guide to the best atta for making roti. There is traditional, basic atta, and also some atta with a little bit extra. 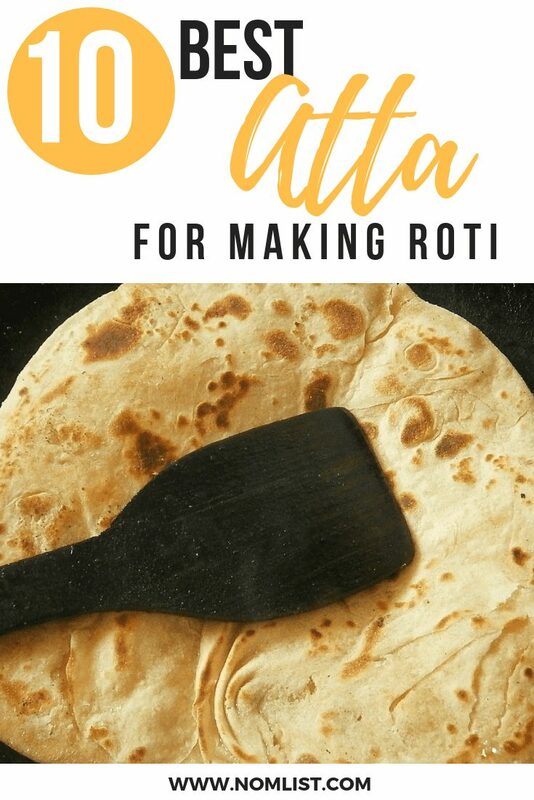 Find the atta you need to make the most delicious and soft roti in your own kitchen. This gluten free Atta is obtained from Rajgira, amaranth seeds, and provides great protein, especially for a vegetarian diet. Graminway produce the atta in small batches which allows them to maintain the freshness and the ingredient texture. Each batch of atta is fresh and ready to use. It has a shelf life of up to 4 months when stored in a cool, dry place, giving you enough time to make some delicious roti. You can also use the Graminway Gluten Free Atta to make cheela and dose. It is a healthier option to the usual wheat flour and will provide a delicious, authentic tasting roti, without the gluten. Sujata offers up the promise of soft and tasty rotis each and every time. It is a multi-grain flour atta and has all the goodness a decent atta should have. It is 100% vegetarian and contains only the finest ingredients. Sujata Atta contains essential ingredients that are a part of a wholesome diet, perfect for daily nutritional requirements. Made up of multi grains, this atta is made with a unique blend of soy, wheat, oats, maize, ragi and chana. All authentic grains that have unique nutritional value. With the promise of fresh and authentic tasting rotis, Sujata Atta is worth a try for roti enthusiast. This is an atta for the health-conscious. It is a nutritive atta that is gluten free and really just pretty healthy for you. On top of that, the atta is completely organic and preservative free. The Nutty Yogi Gluten Free Atta is made with the grains that matter, not just the grains that act as fillers. It is a combination of sorghum, potato flakes, amaranth, corn starch, ajwain and gum. The atta has a shelf life of 120 days, so it can be stored for a decent amount of time. Nutty Yogi have managed to bind the two superfoods – jowar and amaranth, together with gond, a naturally occurring resin with regenerative attributes, to create this super healthy, super fresh atta. It will give you light and fresh rotis, as well as all the goodness you need. This preservative free atta flour from Niva is ideal for any kitchen. It is a high quality atta flour that can also be used to make chappati, paratha and puri. It is made from a combination of durum wheat flour and wheat bran, and is a perfect basic to keep in the kitchen. It gives the authentic Indian cuisine taste to rotis, with that real homemade taste. Nirav is a reliable brand when it comes to Indian cooking, so you know that the atta will be of the highest quality. Nirav Durum Atta Flour is a great basic atta that will help you produce fresh and fail-proof rotis each and every time. It is easy to work with and easy to fry up once made. The Aashirvaad Whole Wheat Atta is 100% whole wheat chapati flour with no added maida. It is made from only the highest quality grains that add to the texture and the taste of the roti. It is easy to work with and has a beautiful amber color, true to the traditional roti. The dough made using this Aashirvaad Whole Wheat Atta absorbs water well, meaning the rotis stay softer for longer. It is a trusted and traditional brand, perfect for home use and making deliciously authentic rotis. Graminway has another great atta flour that is vegetarian and made with only the best ingredients. The vegetarian roti flour is made from refined flour, semolina, sugar and salt. It has a shelf life of 120 days when stored correctly. The flour gives the original taste of India, with freshly sourced ingredients that are staples in every diet. Also used to make Bhatura, this flour is versatile to keep in the kitchen to make a variety of dishes. Graminway promise that each of their products contain ingredients that are rich in nutrients and dietary fibres, and that each product maintains its freshness and preserves the integral texture of the product. Another atta from Sujata, the Chakki Atta is made using 100% whole wheat flour. It provides the necessary whole grains needed in a daily diet. The whole wheat grain has three parts – fibre rich bran, endosperm and the germ. These three components have antioxidants, vitamins, minerals, complex carbohydrates and phytonutrients that all come together to help maintain a balanced, good health. The Sujata Chakki Atta helps produce soft, flavorful rotis each time and will become a staple in any kitchen. Jiva have this USDA certified organic atta from the USA. It contains only the highest quality ingredients, all of which are organic . The atta is perfect to make rotis, but also great for puris and chappatis. The wheat has been grown without pesticides, chemicals or fertilizers, and has come from certified organic farms within India. The vacuum packed bag ensures the flour stays fresh and free of contamination, ready to be opened and used in your kitchen. It is a great, organic option when looking for original atta, and has all the health benefits for daily grain intake, as well as an incredible, traditional atta taste. If you want proper organic, close to nature chakki atta, this is the one for you. It is cultivated within India and is grown without the use of pesticides, chemicals and fertilizers. The Mother Organic Indian Flavoured Chakki Atta is 100% certified organic and contains the roughage and material naturally found in wheat, which aids digestion and enhances flavour. The wheat isn’t the finely ground wheat found in many chain store attas, but is still finely ground enough to provide a smooth and soft roti after cooking. It is low in gluten making it easy to chew, but still maintaining the strength a roti needs. The Deep Whole Wheat Atta is made using the best quality process and premium whole wheat atta. It is great to use to make roti, paratha, puri and bhakari. It is 100% whole wheat flour and low-fat. Imported directly from India, it is authentic and original, giving the roti the perfect homemade taste. It is made without any maida and forms part of a healthy-heart diet. For a healthy, fail-proof atta, this is a great option. It can be used for many dishes in the kitchen, but still maintains the taste of India that every roti needs to have. Atta is a basic in every Indian kitchen. It is a finely milled whole wheat flour made from the entire wheat berry. It is traditionally used to make rotis and other dough goods in Indian cooking. But what makes a good atta, and what should you look for when buying one? Gluten content – Atta is made using hard wheats, which gives it a high gluten content. This helps the dough have elasticity and be strong, allowing it to be rolled into thin sheets. However, there are some attas that are gluten free which should still work the same. Grounding process – Traditionally atta was ground in a stone chakki mill. It is usually still done so now, but on an industrial scale. This damages the starch in the atta, which allows the dough to become sticky. This stickiness helps the rotis become softer, as the dough absorbs more water. Organic – Many people prefer to buy certified organic ingredients for cooking. Luckily, there are some great attas that are certified organic. There are certified organic farms in India that provide the wheat for the atta, so it is still authentic to its home county. 100% Whole Wheat – It is important to use atta that is 100% whole wheat. Make sure there is no added maida in the flour. The whole wheat forms part of your daily requirements and also keeps the nutritional content healthy. Now that you have chosen your good quality atta, you need a fail-proof roti recipe to get you started. Roti is a handmade bread that is flat and usually served with a curry of sort, be it meat curry or beans curry. It should be soft yet flaky, easy to peel and eat with. 1. Add 350g of the atta into a bowl, along with the oil and the hot water. Mix with a spoon. 2. Dust the worktop with some atta. Remove the dough from the bowl and place it on the prepared worktop. 3. If the dough is too sticky, add some flour. If it is too dry, add some water. Knead the dough until it is soft and pliable. This could end up taking up to 5 minutes, but it is important to knead it until it has the right consistency. 4. Place the dough back in the bowl and cover with a dishcloth. Leave it to rest for up to 10 minutes. 5. Break a small piece of the dough and use a rolling pin to roll it out into a large circle. Spread the melted butter or ghee over the top of the dough. 6. Roll the doll into a long roll and cut into even pieces. Press down on each piece and roll into a flat, circular shape. It is important to get the dough as thin as possible. 7. Cook the roti in a preheated pan and let cook for around 1 minute. When flipped over, press down lightly to ensure the roti cooks evenly. When the roti rises and bubbles form with brown spots, it is ready to be taken off the heat. Your ready to eat roti should be able to be peeled in a few layers and should be light and soft to eat. Perfecting a roti isn’t too difficult with a little bit of practice and the right ingredients and tools! Now you have everything you need; the right atta, the roti recipe and the excitement to eat all the rotis and curries, you are ready to go. The right atta will help you achieve the perfect roti time and time again, exactly the roti you remember having growing up. It is easy to make and is a bread that can be enjoyed with so many different meals! Try out different atta to see which is best for you and your family, you will soon find the one that will help you be a great home cook!